“I should like you to be free of anxieties.” Those were the first words of St. Paul in the second reading this past Sunday. Paul wasn’t crazy, though. He lived in the real world, and he knew that normal people have lots of anxieties in life. He even says so much. But, what does he say we should be anxious about? Paul makes an interesting distinction. He looks at unmarried men & women differently than he looks at married people. What does he say married folks are anxious about? “The things of the world.” And what does he say unmarried folks—young folks—should be anxious about? This is the kicker: “the things of the Lord.” Is that the answer you would have expected? The last couple of days, I’ve been thinking about this in terms of my own existence as a priest and specifically as an assistant pastor. The pastor of my parish has concern for many of the “things of the world” that I don’t. For example, I don’t pay the bills to heat and cool the church. I don’t take care of the maintenance in the gym. I’m not involved in the administration of our wonderful school. The result is that I have more time to be concerned with “the things of the Lord.” I have plenty of opportunity, for example, to visit the sick. I have time to be involved in CYO events. I have the opportunity to spend serious time in prayer every day. Hopefully I make good use of that availability, because God will hold me accountable for it. Now, of course, my pastor does all of those things, too, so his duties among “the things of the world” are really in addition to his responsibilities to “the things of the Lord.” So Paul doesn’t mean that adults should no longer be anxious about “the things of the Lord.” He means that “the things of the world” get added on top of their responsibilities. It works the same way for parents and children in a family, doesn’t it? Children have certain responsibilities: prayer, study, recreation, helping out around the house. Parents have those responsibilities in addition to others: paying the bills, providing shelter, earning a paycheck, raising children, contributing to the community. What all this means for young people is simple: they should be grateful for the time and freedom and opportunity they have now to serve the Lord. And what it means for adults is this: we are not excused from “the things of the Lord” simply because “the things of the world” are pressing down upon us. All of us—young or old, married or unmarried—are equally responsible for serving the Lord. 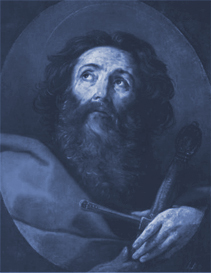 “I should like you to be free of anxieties,” St. Paul says. And, yet, there are so many things competing for our time and attention. At the very least, we can prioritize the demands that are placed upon us. When we do that, “the things of the Lord” must always take first place.